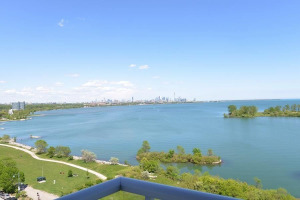 A Large 2 Bedroom Unit Plus Den Space On A Lower Floor With Park And Lake Views. Features Multiple Walk-Outs To An Over Sized Terrace Facing The Quiet Park/Lake And City Sky-Line. Well Maintained By Current Owner. Includes All Utilities Including Hydro. Parking Space Located Next To Elevator. Can Also Be Made Available Furnished If Need Be. Building Offers Excellent Amenities. Enjoy All That Waterfront Living Has To Offer.